Growing up in Suva in his native Fiji, Sisa Waqa could only dream of donning the famous lime green jersey of the Raiders in the NRL just like his idol Noa Nadruku. On Thursday at Raiders HQ, the Raiders recruit not only got to meet his idol, but he also had the chance to present him with a Raiders Legacy jersey which features the name of the former try scoring machine and fellow Fijian Noa Nadruku, along with all Raiders from 1982-2013. The meeting was the first between the pair, with Waqa having the chance to finally shake the hand of the man who he looked up to as a 10 year old boy growing up in Fiji. After years of hard work and four outstanding seasons with the Melbourne Storm, Waqa has the opportunity to live out one of his childhood fantasies. As a youngster during the halcyon days of the Raiders, Waqa idolised the likes of Laurie Daley, Mal Meninga and Ricky Stuart, but more than anybody, it was the flying Fijian Noa Nadruku that stole his affection. Waqa would spend his days on playing fields in Fiji mimicking Nadruku’s every step, swerve and long range try in the bold quest to one day emulate his breathtaking feats. Interestingly, although Waqa has never met Nadruku (until now), his father Eddie played with the man who netted 73 tries in 92 games for the Green Machine during the 1990s. In conjunction with wishing his father all the best of luck before he departed for the tournament, a five year old Sisa Waqa asked his father for just one thing. 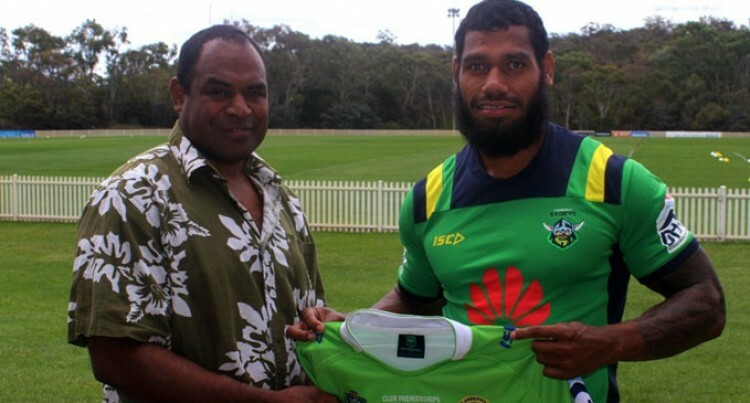 “Before my dad came out to Australia to play local club footy and in the sevens tournament, the one thing that I asked him for was to bring me back a Canberra Raiders jersey when he came home,” Waqa said with a smile on his face. Fast forward to 2015 and Waqa will now have the opportunity to once again don the Raiders jersey and attempt to emulate the great feats of Nadruku. “Running out onto GIO Stadium in the Raiders jersey is something that I’ve been dreaming about. Whether it is a trial game or in the Nines, it will be a massive thing for me to pull on that famous green jumper for the first time.